With best-in-class quality assurance, Letco Medical stands firmly behind each and every product we sell. Letco has a proud history of being a quality leader in the compounding industry. 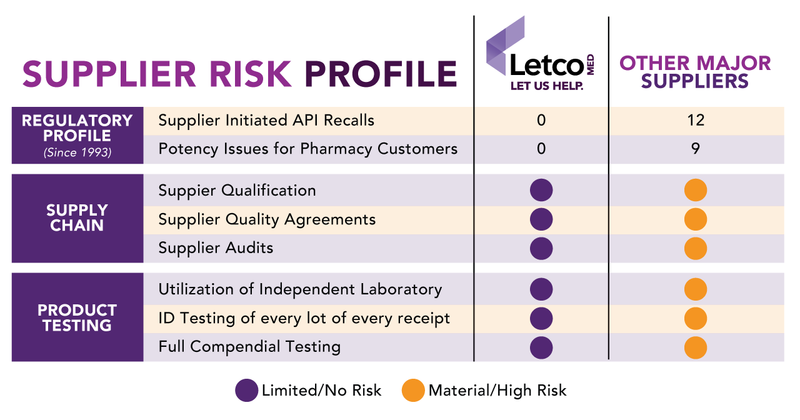 Letco’s relentless focus on quality makes us the optimal choice for pharmacies. Our customers trust our stringent quality control procedures, industry-leading quality assurance programs, and unmatched quality record with the FDA. It’s easy to talk about quality, but what really matters is performance. Compare us with other suppliers, and Letco’s record speaks for itself. Our Quality Management systems are governed by a robust Quality Manual and 175+ procedures establishing an infrastructure that ensures Letco’s procedures, processes and resources deliver excellent product quality. We have an extremely high degree of confidence in our Quality infrastructure, as it is driven by an extremely experienced and long-tenured Quality Assurance unit embedded within our Operations. From the first link in the supply chain to the last, we ensure the integrity of our suppliers by fully and rigorously qualifying our channel partners and validating quality at product origin. We also deploy a proactive supplier audit program that ensures standards are maintained at all times. Quality of raw materials can vary by manufacturer, supplier, batch and receipt, so we check and maintain quality at every step with rigorous receiving, validation, testing, and verification processes. Full compendia product testing is performed by leading third-party labs to ensure we provide our customers with only the safest and best quality product every time. Our products are held and distributed under the strictest conditions, with 24/7 electronic temperature and humidity monitoring, temperature mapping, USP storage conditions for all product types, validated cold chain packaging, and VAWD accreditation. A procedure is only as good as its execution. Our experienced operators are regularly assessed and are trained annually on our rigorous operating procedures to ensure continuous delivery of superior quality in all they do.